If you know me you know I am a big baseball fan and we go to a lot of Mets games during the season.Of course I enjoy the games and love watching and going to the stadium with Sean and Michelle, but there are also some great opportunities for eating that go on at Citi Field, more than there ever was at Shea Stadium. You can get great pastrami sandwiches, a shrimp po’boy, pizza, burgers, hot dogs, special fries, Shake Shack, Blue Smoke, and the list goes on and on. One of Michelle’s personal favorites is the stand set up by Pat LaFrieda that offers his meatball sliders sandwiches (which are out of this world) and his filet mignon steak sandwich, is unlike any other cheesesteak sandwich you will find. 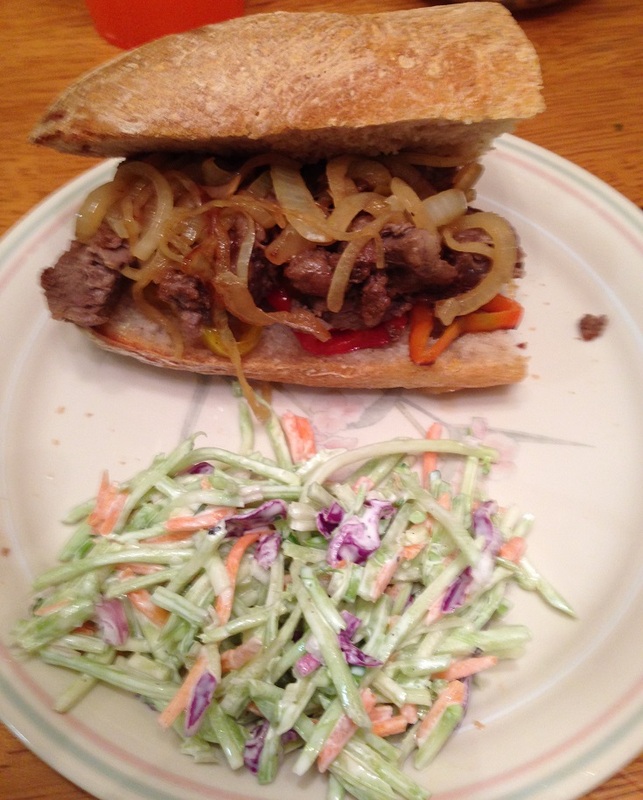 Michelle had been asking me for a while to try to find a recipe and I finally came across one at Food Republic for this phenomenal steak sandwich and we just happened to have a small piece of tenderloin in the freezer that I could use. In a large skillet, heat 2 tablespoons of the canola oil over medium heat until the oil slides easily in the pan, about 2 to 3 minutes. Add the sliced onions and cook, stirring occasionally so the onions do not stick to the pan, until the onions are soft and caramelized, about 20 minutes. Spread the onions out over the surface of the pan. Remove the pan from the heat and lay the Monterey Jack cheese on top of the onions, letting the cheese melt. To make a jus, in a small saucepan bring the beef stock to a simmer over medium heat. Remove the pan from the heat and stir in the balsamic glaze. Cover the pan to keep the jus warm. Season the tenderloin pieces on both sides with the kosher salt and the sugar. in another large skillet, heat the remaining 2 tablespoons of the canola oil over high heat. Add half of the filet medallions, or as many as will fit in a single layer in the pan, and sear them until they are caramelized, about 1 to 1 1/2 minutes per side. Cook the remaining filet medallions the same way, adding more canola and letting the oil get hot before adding the meat to the pan. Meanwhile, without opening them, toast the baguettes so that the outsides, top and bottom, are hot and crispy. Halve the baguettes horizontally, leaving them hinged on one side. To assemble the sandwiches, lay 3 medallions on the bottom of each baguette. Top the medallions with the onions and cheese, dividing the onions and cheese equally among all of the sandwiches. Drizzle 1/4 cup of the jus on the inside top half of each baguette and serve. These sandwiches are amazing. The meat is super tender and cooked perfectly and the recipe is so simple but you get fantastic flavor from the onions and the jus. The balsamic glaze is quite simple to make on your own as it is just a mixture of balsamic vinegar and sugar that you warm in a saucepan until a glaze starts to form. The baguettes I used are actually from a recipe I posted recently from Mark Bittman for his not quite whole grain baguettes and they went perfectly with the meat. While Michelle and Sean had onions and cheese on theirs, I left the cheese off of mine and put some roasted red peppers on there instead, which was quite yummy. You could try this with other cuts of steak if you want to make a more inexpensive version and I think it would taste good, but if you have the chance to be decadent and use the filet medallions, go for it.